The Hob Knob is a country inn located on the Mountain Road two miles from Stowe Village and four miles from Mount Mansfield. Our ten beautiful hillside acres include wide lawns, flower gardens, peaceful ponds and a surrounding forest of white birch, poplar, maple and pine. The original building - Stowe's First Ski Lodge - includes a dining room, lounge, office, two guest rooms with fireplaces and a suite with Jacuzzi. A rustic cabin is located on a wooded knoll close by. 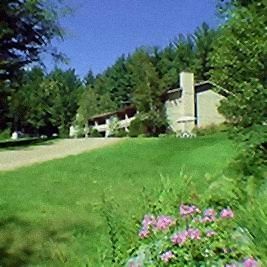 Farther up the hillside, well removed from traffic, is the Lodge with 17 spacious and tastefully decorated rooms with private entrances and connecting interior hallways. Built high up on the side of a ridge, rooms in this building offer spectacular views of Mount Mansfield. All rooms have queen or king beds, cable TV, Radios, telephones, hair dryers, in-room coffee, air conditioning and large picture windows. This and other Stowe Bed and Breakfast Inns can be found here online in The Register.